Rule #1 has been selected for The Louis Vuitton Hawaii International Film Festival as well as The Taipei Golden Horse Film Festival. It is also in competition for the Asia Pacific Screen Awards. PUCHEON (South Korea) – Actors Shawn Yue and Ekin Cheng have won the Best Actor Award here for the Kelvin Tong movie Rule #1. The award was announced at the 12th Pucheon International Fantastic Film Festival’s Award Ceremony on Friday (25th July 2008). Singapore filmmaker Tong received the award on behalf of Yue and Cheng. “The Korean audiences were very thrilled by Rule #1, and I am very grateful that Shawn and Ekin beat out a lot of high-profile competition to take the honours for Singapore and Hong Kong,” said Tong. Rule #1 was also in the running for the festival’s top competition – the Puchon Choice Feature – which included this year’s Korean blockbuster The Chaser and Hollywood entry The Objective. 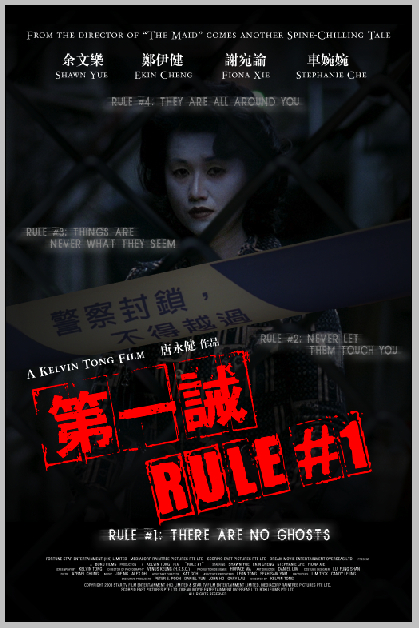 Rule #1, a horror thriller, sees Yue playing a rookie cop and Cheng as an alcoholic veteran in charge of a police department that handles supernatural cases. Rule #1’s double-win marks the second time that Tong has scored at the Pucheon International Film Festival. In 2006, the award-winning director’s The Maid garnered the Best Asian Film Award. For more information, kindly contact Leon Tong at leon@bokufilms.com (mobile: 65-91829595) or Kat Goh at katgoh@bokufilms.com (65-98565858). An award-winning Singapore film-maker, Kelvin Tong’s work is marked by an exciting eclecticism that defies categorization. Eating Air, his 1999 co-directorial debut with Jasmine Ng, fused teenage angst with kung fu and motorbikes. The feature went on to win the Young Cinema Award at the 2000 Singapore International Film Festival and the FIPRESCI prize at the 2000 Stockholm International Film Festival. Representing Singapore extensively in the international film-festival circuit, the arthouse gem screened and competed in the Vancouver International Film Festival, Hongkong International Film Festival, Helsinki International Film Festival, Moscow Sochi International Film Festival, Udine International Film Festival, Barcelona International Film Festival, Los Angeles Asian-American Film Festival, Manila Film Festival, Tokyo PIA International Film Festival, Warsaw International Film Festival, Denmark International Film Festival, the inaugural Deauville Film Festival and the CineAsia Film Festival in Cologne, Germany. With his second feature, The Maid (2005), Kelvin Tong went from arthouse to populist. The atmospheric horror film broke box office records in Singapore and was acquired by Fortissimo Films for worldwide distribution. 2006 marked a return to Kelvin Tong’s arthouse roots with his third feature, Love Story. A collaboration with Hong Kong’s Focus Films, the metaphysical romance took the Best Director Award at the 2006 Singapore International Film Festival and was also honored as the closing film at the 2006 Locarno International Film Festival. In 2007, Kelvin Tong embarked on his first Asian production, Rule #1. The horror-thriller, which stars Shawn Yue and Ekin Cheng, saw the writer-director training his lens beyond Singapore for the first time. Every day, the Police Force receives 185 phone calls. 180 of them are about burglaries, murders, rapes and kidnappings. For rookie Sergeant Lee (Shawn Yu), being a cop means running down crooks and upholding the law. Injured in a shoot-out, he finds out to his horror that he is reassigned to the dubious-sounding Miscellaneous Affairs Department (MAD). A swimming pool caretaker calls the Police about strange noises at his workplace. Lee and Wong are dispatched to the scene. Lee seems to be on the brink of uncovering something sinister when Wong traces the source of the ghastly noise–a clogged-up water pump. Putting Lee down, Wong explains MAD’s rule number one–There are no ghosts. A firm believer of truth and justice, Lee cannot reconcile himself to MAD’s shady practices. As he rebels against the system, the young cop realizes that there is a grain of truth in Wong’s advice. Slowly, Lee is sucked into a world of deceit and cover-ups. His relationship with his girlfriend May (Fiona Xie) suffers as MAD begins investigating a string of bizarre teenage suicides. A girl is found to have hung herself from a height of five feet. Another girl is discovered to have drowned herself in a fish tank. Impossible suicides. Unless, the victims were possessed. As Lee and Wong follow the clues, they realize that something sinister is heading their way. A serial killer who was shot by Lee before his reassignment to MAD is back–as a ghost. He is moving from girl to girl, leaving a grisly trail of carnage in his wake. While Lee doggedly pursues this ancient feud, Wong has second thoughts about his flagging career at MAD. The veteran hooks up with his former wife Esther (Stephanie Che) and makes plans to quit the force. On Wong’s last day, Lee tracks the serial killer’s ghost down to a warehouse. A showdown ensues–in which nobody is let off. It started with a simple what if. What if there are ghosts and the Police know about it? Do they then tell the truth or do they lie? Therein lies the premise of Rule #1. I wanted a film that explored the spectrum between black and white. I was interested in making a film that is gray. With Rule #1, I was able to achieve that with a storyline that was about two cops confronted by the supernatural and their subsequent struggle to reconcile their awful knowledge with their mission to serve and protect the public. In other words, to really protect the innocent, do you tell them that there is a ghost in their apartment or do you lie and blame the strange noises on a faulty water pipe? Rule #1 is a horror-thriller about cops. There are no helpless female victims here. Instead, the prey are policemen who, despite possessing guns, find themselves at their wits’ end when confronted by bloodthirsty ghouls and spirits. Rule #1 takes place in an unnamed Asian city and tells the story about two cops-a rookie and veteran. As the body-count rises and our two protagonists find themselves ankle-deep in blood, themes of bonding, faith, heroism and betrayal are explored. As good battles evil, the line is drawn somewhere between the truth and lies. This is no man’s land. This is gray. Filmed entirely in Hong Kong, Kelvin Tong’s horror-thriller Rule #1 took in locations around the atmospheric city. Iconic landmarks such as Lingnan University, Hong Kong Plaza in Causeway Bay, a romantic beach-side bar in Repulse Bay and a disused water-filtration plant in Stanley which was featured in many Johnnie To films, served as the US$ 2 million movie’s locales. Principal photography began in 6 September 2007 and lasted for 19 days. Offline post-production was completed at China Star Production Services Ltd while Cinedigit Sound Ltd handled the audio work. Music scoring was undertaken in Singapore and integrated into the film’s final dolby mix in Hong Kong. Shaw Brothers (Hong Kong) Ltd produced the final prints of Rule #1.